Choosing the right hedge for the right landscaping use is not that difficult. You need to look at what is best suited to your climate, soil and height width requirements. Once you have determined these, you can then choose the hedging plant that best suits your needs. You may also be looking for a flowering hedge, and here again the choice is varied. For example, Magnolia Starbright, (pictured right) has a few great qualities that will endear it to landscapers and gardeners alike. Easy to prune to height and width. Masses of flowers in spring. Hardy and drought tolerant once established. Many plants are used as screens and informal barriers and some are better than others. As for the best, it will depend on what you are after in a hedge and where you are in Australia. Hedging plants may be short, such as buxus or box hedges trimmed to size or taller growing plants such as Conifers, Lilly Pillies and others. The best hedging plants will depend a little on your requirements, climate, soil, required height, flowering, evergreen and just plain personal taste. So what are the qualities of a good hedge ? Lilly Pilly or Acmena smithii. The Lilly Pilly is an Australian Native plant used widely as a hedging plant. It comes in many forms and will reach anywhere between 2m and 5m depending on cultivar and growing conditions. Generally easy to prune and a good dense hedging plant. We know they are a little slow to get going, however camellias do make a great hedge in a larger garden. Dense foliage, will reach 3m plus, require little pruning unless you want a more formal look and really tough in the right climate. They also flower in winter and spring. If you have room, worth considering. Originally from New Zealand Pittosporum tenuifolium is a fast-growing hedge. Lots of cultivars here with different characteristics. Silver Sheen, James Stirling and Green Pillar are all popular. 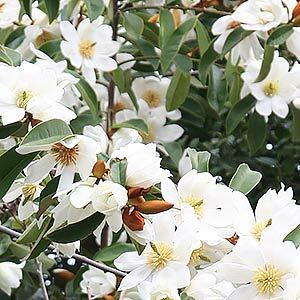 Evergreen Magnolias, Magnolia Grandiflora cultivars, make great screening plants. Look for ‘Magnolia Little Gem’, ‘Magnolia Kay Parris’ and ‘Magnolia Teddy Bear’ for a medium sized flowering scented hedge. If you are looking for a fragrant flowering hedging plant then Murraya paniculata could be it. It will reach 4m, but can be contained to 1-2m fairly easily. Murraya paniculata does not like frosts. Flowers in spring.